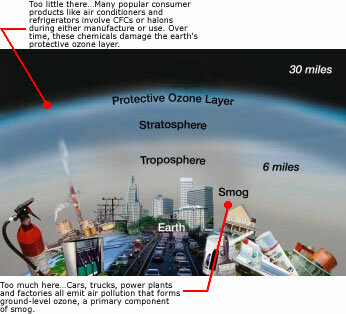 Ozone is a gas that occurs both in the Earth’s upper atmosphere and at ground level. Ozone can be “good” or “bad” for people’s health and for the environment, depending on its location in the atmosphere. The stratosphere extends upward from about 6 to 30 miles. The stratospheric or “good” ozone protects life on Earth from the sun’s harmful ultraviolet (UV) rays. Ozone is produced naturally in the stratosphere. But this “good” ozone is gradually being destroyed by man-made chemicals referred to as ozone-depleting substances. Ozone depletion can cause increased amounts of UV radiation to reach the Earth which can lead to more cases of skin cancer, cataracts, and impaired immune systems. Overexposure to UV is believed to be contributing to the increase in melanoma, the most fatal of all skin cancers. Ground-level or “bad” ozone is not emitted directly into the air, but is created by chemical reactions between oxides of nitrogen (NOx) and volatile organic compounds (VOC) in the presence of sunlight. 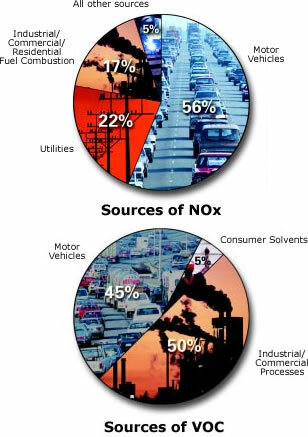 Emissions from industrial facilities and electric utilities, motor vehicle exhaust, gasoline vapors, and chemical solvents are some of the major sources of NOx and VOC. Breathing ozone can trigger a variety of health problems including chest pain, coughing, throat irritation, and congestion. It can worsen bronchitis, emphysema, and asthma. “Bad” ozone also can reduce lung function and inflame the linings of the lungs. 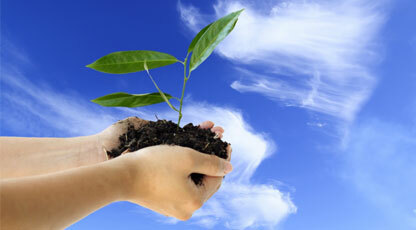 Since 1995, on 16 September each year, the International Day for the Preservation of the Ozone Layer is celebrated. Plant more trees.Stop cutting them.